Crewe /kruː/ ('Cryw' in Welsh) is a railway town and civil parish within the borough of Cheshire East and the ceremonial county of Cheshire, England. The area has a population of 71,722. Crewe is perhaps best known as a large railway junction and home to Crewe Works, for many years a major railway engineering facility for manufacturing and overhauling locomotives, but now much reduced in size. From 1946 until 2002 it was also the home of Rolls-Royce motor car production. The Pyms Lane factory on the west of the town now produces Bentley motor cars exclusively. 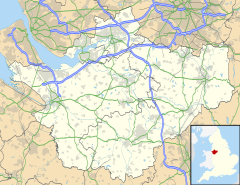 Crewe is 158 miles (254 kilometres) north of London and 35 mi (56 km) south of Manchester. This article is about the town in England. For other uses, see Crewe (disambiguation). The railway station remained part of the civil parish of Crewe, outside the boundary of the municipal borough until 1936. So, throughout its history, the town of Crewe has neither been part of, nor has it encompassed first the township of Crewe, later the civil parish of Crewe, and later still the civil parish of Crewe Green adjacent to it, even though these places were the direct origin of the name of the town via the railway station which was also not part of the town before 1936. An old, local riddle describes the somewhat unusual states of affairs: "The place which is Crewe is not Crewe, and the place which is not Crewe is Crewe." Until the Grand Junction Railway (GJR) company chose Crewe as the site for its locomotive works and railway station in the late 1830s, Crewe was a village with a population (c. 1831) of just 70 residents. Winsford, 7 miles (11 km) to the north, had rejected an earlier proposal, as had local landowners in neighbouring Nantwich, 4 miles (6 km) away. Crewe railway station was built in fields near to Crewe Hall and was completed in 1837. A new town grew up, in the parishes of Monks Coppenhall and Church Coppenhall, alongside the increasingly busy station, with the population expanding to reach 40,000 by 1871. GJR chief engineer Joseph Locke helped lay out the town. The town has a large park, Queen's Park (laid out by engineer Francis Webb), the land for which was donated by the London and North Western Railway, the successor to the GJR. It has been suggested that their motivation was to prevent the rival Great Western Railway building a station on the site, but the available evidence indicates otherwise. The railway provided an endowment towards the building and upkeep of Christ Church. Until 1897 its vicar, non-conformist ministers and schoolteachers received concessionary passes, the school having been established in 1842. The company provided a doctor's surgery with a scheme of health insurance. A gasworks was built and the works water supply was adapted to provide drinking water and a public baths. The railway also opened a cheese market in 1854 and a clothing factory for John Compton who provided the company uniforms, while McCorquodale of Liverpool set up a printing works. During World War II the strategic presence of the railways and Rolls-Royce engineering works (turned over to producing aircraft engines) made Crewe a target for enemy air raids, and it was in the flight path to Liverpool. The borough lost 35 civilians to these, the worst raid was on 29 August 1940 when some 50 houses were destroyed, close to the station. Crewe crater on Mars is named after the town of Crewe. Crewe was described by author Alan Garner in his novel Red Shift as "the ultimate reality". Crewe is within the United Kingdom Parliamentary constituency of Crewe and Nantwich. 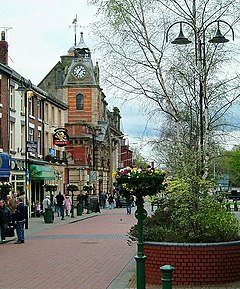 Crewe is within the ceremonial county of Cheshire. At local government level, Crewe is a community administered by Cheshire East Council and, from 4 April 2013, by Crewe Town Council. The railways still play a part in local industry at Crewe Works, which carries out train maintenance and inspection. It has been owned by Bombardier Transportation since 2001. At its height, the site employed over 20,000 people, but by 2005 fewer than 1,000 remained, with a further 270 redundancies announced in November of that year. Much of the site once occupied by the works has been sold and is now occupied by a supermarket, leisure park, and a large new health centre. There is still an electric locomotive maintenance depot to the north of the railway station, operated by DB Schenker Rail. The diesel locomotive maintenance depot has recently reopened as a maintenance facility for a private steam company and has undergone major structural repairs. The Bentley car factory is on Pyms Lane to the west of town. As of early 2010, there are about 3,500 working at the site. The factory used to produce Rolls-Royce cars, until the licence for the brand transferred from Bentley's owners Volkswagen to rival BMW in 2003. There is a BAE Systems Global Combat Systems factory in the village of Radway Green near Alsager, producing small arms ammunition for the British armed forces. The headquarters of Focus DIY plc, which went into administration in 2011, was in the town. Off-licence chain Bargain Booze is also Crewe-based. It was bought-out in 2018 by Sir Anwar Pervez' conglomerate Bestway for £7m, putting drinks retailing alongside its Manchester-based Well Pharmacy. There are a number of business parks around the town hosting light industry and offices. Crewe Business Park is a 67-acre site with offices, research and IT manufacturing. Major presences on the site include Air Products, Barclay's Bank and Fujitsu Services Ltd. The 12 acre Crewe Gates Industrial Estate is adjacent to Crewe Business Park, with smaller industry including the ice cream van manufacturer Whitby Morrison. The Weston Gate area has light industry and distribution. Marshfield Bank Employment Park is to the west of the town, and includes offices, manufacturing and distribution. There are industrial and light industrial units at Radway Green. The town has two small shopping centres: the Victoria Centre and the Market Centre. There are indoor and outdoor markets throughout the week. Grand Junction Retail Park is just outside the centre of town. Nantwich Road provides a wide range of secondary local shops, with a variety of small retailers and estate agents. The Market Centre is the largest shopping centre in Crewe. It is situated in the heart of the town centre with 22 national retailers including River Island, Wilkinsons, Argos, Iceland and Dorothy Perkins. There are three large car parks nearby and Crewe Bus Station is a five-minutes walk from the shopping centre. It has a weekly footfall of approximately 100,000 visitors. A planned redevelopment of Crewe's town centre, including the current bus station and main shopping area were abandoned because of "difficult economic conditions" during 2008. There were also plans to revamp the railway station which involved moving it to Basford. This was pending a public consultation by Network Rail scheduled for autumn 2008, but no such public consultation was done. The plan was abandoned and maintenance work was carried out on the current station instead. Cheshire East Council developed a new regeneration master plan for Crewe, which included the opening of a new Lifestyle Centre, with a new swimming pool, gym and library. Crewe has been proposed as the site of a transport hub for the new HS2 line, with development planned for completion in 2027. Crewe railway station is less than a mile from Crewe town centre, although it was not incorporated into the then Borough of Crewe until 1937. It is one of the largest stations in the North West and a major interchange station on the West Coast Main Line. It has 12 platforms in use and has a direct service to London Euston (average journey time of around 1 hour 35 minutes), Edinburgh, Cardiff, Liverpool, Manchester, Birmingham, Glasgow, Derby, Stoke-on-Trent, Chester, Wrexham and Holyhead for the ferry connections to Dublin Port. Many other towns and cities also have railway connections to Crewe. Crewe is on the A500, A530 and A534 roads, and is less than 5 miles (8.0 km) from the M6 motorway. The main bus company in Crewe is D&G Bus following the reduction of funding given to Arriva North West, who still run longer distance services to Chester, Northwich, Macclesfield and Winsford. Other operators include BakerBus and First Potteries who operate a single service running into Stoke-on-Trent. The closest airport to Crewe is Manchester Airport which is 30 miles (48 km) away followed by Liverpool John Lennon Airport which is 40 miles (64 km) away. Crewe Heritage Centre is located in the old LMS railway yard for Crewe railway station. The museum has three signal boxes and an extensive miniature railway with steam, diesel and electric traction. The most prominent exhibit of the museum is the British Rail Class 370 Advanced Passenger Train. The Grade II-listed Edwardian Lyceum Theatre is in the centre of Crewe. It was built in 1911 and shows drama, ballet, opera, music, comedy and pantomime. The theatre was originally located on Heath Street from 1882. The Axis Arts Centre is on the Manchester Metropolitan University campus in Crewe. It relocated from the university's Alsager Campus when it closed. The centre has a programme of touring new performance and visual art work. The Box on Pedley Street is the town's main local music venue. Both the Lyceum Theatre and the Axis Arts Centre feature galleries. The private Livingroom art gallery is on Prince Albert Street. The town's main library is on Prince Albert Square, opposite the Municipal Buildings. Crewe has six Anglican churches, three Methodist, one Roman Catholic (which has a weekly mass in Polish) and two Baptist. There is a museum dedicated to Primitive Methodism in the nearby village of Englesea-Brook. The Jacobean mansion Crewe Hall is located to the east of the town near Crewe Green. It is a grade I listed building, built in 1615–36 for Sir Randolph Crewe. Today, it is used as a hotel, restaurant and health club. There is a multiplex ODEON cinema on Phoenix Leisure Park on the edge of the town centre, as well as a bowling alley. Queen's Park is the town's main park, and is currently undergoing a £6.5 million transformation. It features walkways, a children's play area, crown green bowling, putting, a boating lake, grassed areas, memorials and a café. Jubilee Gardens are in Hightown and there is also a park on Westminster Street. Crewe Carnival does not take place each summer now due to lack of funding by CEC. The weekly Crewe Chronicle, the Crewe and Nantwich Guardian and the daily Sentinel newspapers all cover the town. Local radio stations are Silk 106.9 from Macclesfield, Signal 1 and Signal 2 from Stoke-on-Trent and BBC Radio Stoke. Nantwich-based RedShift Radio is a community internet radio station covering Crewe, Nantwich and South Cheshire. The Cat, based in South Cheshire College broadcasts on FM to Crewe, Nantwich and surrounding areas on 107.9FM and online as Crewe and Nantwich's first and only dedicated FM radio station. Cheshire has adopted the comprehensive school model of secondary education, so all of the schools under its control cater for pupils of all levels of ability. Until the late 1970s Crewe had two grammar schools, Crewe Grammar School for Boys, now Ruskin High School and Crewe Grammar School for Girls, now the Oaks Academy (formerly Kings Grove School). The town's two other secondary schools are Sir William Stanier Community School, a specialist technology and arts academy, and St. Thomas More Catholic High School, specialising in mathematics and computing and modern foreign languages. Although there are eight schools for those aged 11–16 in Crewe and its surrounding area, South Cheshire College is one of only two local providers of education for pupils aged 16 and over, and the only one in Crewe. The college also provides educational programmes for adults, leading to qualifications such as Higher National Diplomas (HNDs) or foundation degrees. In the 2006–07 academic year 2,532 students aged 16–18 were enrolled, along with 3,721 adults. Manchester Metropolitan University's (MMU) Cheshire Faculty is based in Crewe, in a part of town which has been rebranded as the University Quadrant. The campus offers undergraduate and postgraduate courses in five areas: business and management, contemporary arts, exercise and sport science, interdisciplinary studies, education and teacher training. The campus underwent a £70 million investment in its facilities and buildings in 2015. The campus was used as a pre-games training camp for the London 2012 Olympic Games. Crewe's local football club is Crewe Alexandra. During the late 20th century the club enjoyed something of a renaissance under the management of Dario Gradi, playing in the First Division – the second tier of the professional pyramid – for five seasons from 1997 to 2002. Crewe Alexandra currently play in League Two (the fourth tier), having been relegated from League One in the 2015/16 season. In 2013 the club also won its first-ever major silverware after beating Southend United 2-0 in the Johnstone's Paint Trophy final at Wembley. Crewe Alexandra has a reputation of developing young players through its youth ranks; since the early 1980s Geoff Thomas, Danny Murphy, Craig Hignett, David Platt, Rob Jones, Neil Lennon, Dean Ashton and Nick Powell have all passed through the club. Internationals Bruce Grobbelaar and Stan Bowles were also on the books at one time in their careers. Possibly their most famous home-grown player was Frank Blunstone, born in the town in 1934, who was transferred from "The Alex" to Chelsea in 1953, and went on to win five England caps. Crewe's local rugby clubs are both based in or near Nantwich. The Crewe & Nantwich Steamers (formerly Crewe Wolves), who play in the Rugby League Conference, are based at Barony Park, Nantwich, while Crewe and Nantwich RUFC play their home games at the Vagrants Sports Ground in Willaston. Speedway racing was staged in Crewe in the pioneer days of the late 1920s to early 1930s. The venue was the stadium in Earle Street which also operated in the 1970s. The Crewe Kings raced in the lower division – British League Division Two, then the National League – from 1969 until 1975. At the time the track was the longest and fastest in the UK. Amongst their riders were Phil Crump (father of Jason Crump), Les Collins (brother of Peter Collins), Dave Morton (brother of Chris Morton), Geoff Curtis, John Jackson, Jack Millen and Dave Parry. The stadium has since been demolished to be replaced by a retail park housing a number of national companies. The Crewe Railroaders are the town's American football team, currently competing in the BAFA Central League Division 2 and the subject of the film Gridiron UK which premiered at the Lyceum Theatre on 29 September 2016. Crewe also has its own roller derby team, Railtown Loco Rollers, founded in September 2013. They skate at Sir William Stanier Leisure Centre and compete with skaters and teams from all over the North West. Crewe's main leisure facility is the Crewe Lifestyle Centre, which now houses Crewe's Swimming Pool after the Flag Lane premises closed in 2016. Other notable leisure facilities include Sir William Stanier Leisure Centre and Victoria Community Centre. Harold Hankins CBE FREng (1930 in Crewe – 2009) was a British electrical engineer  and the first Vice-Chancellor of UMIST. Anthony Edward Timpson (born 1973) British Conservative MP for Crewe and Nantwich from the 2008 by-election to 2017. Carey Willetts (born 1976 in Crewe) British musician, songwriter and producer. Sir Philip Craven, MBE (born 1950) president of the International Paralympic Committee (IPC), lives in Shavington. John Edward Morris, (born 1964) former English cricketer, played most for Derbyshire. Bryony Page, (born 1990 in Crewe) an Olympic silver medal winning trampolinist, raised in the village of Wrenbury, 8.5 miles from the town. In Threads (1984), Crewe is destroyed by a single megaton Soviet Union nuclear weapon, given its strategic roles as a transport hub and manufacturer of small arms for the British Army. Fallout from the ground-burst blast contaminates Sheffield and other adjacent cities, worsening their existing problems after being hit in a fictional nuclear exchange between NATO and the USSR in this television docudrama. ^ UK Census (2011). "Local Area Report – Crewe built up area (1119884750)". Nomis. Office for National Statistics. Retrieved 17 May 2018. ^ "Coordinate Distance Calculator". boulter.com. Archived from the original on 8 March 2016. Retrieved 8 March 2016. ^ "Cheshire Historic Towns Survey: Crewe – Archaeological Assessment". Cheshire County Council & English Heritage. 2003. Archived from the original on 3 October 2011. Retrieved 25 August 2010. ^ Mills, David (20 October 2011). A Dictionary of British Place-Names. OUP Oxford. ISBN 9780199609086. Archived from the original on 20 November 2016. Retrieved 19 November 2016. ^  Archived 21 June 2015 at the Wayback Machine states: "This can now be totally dispelled as records show the LNWR Co. originally thought their line to Chester would run alongside the river. However, it was discovered the ground was not firm enough and a more northerly route was decided upon. Had the original thought gone ahead it would have taken the land that was eventually used for Queens Park. It is obvious that a rumour became mixed with a proposal to open a station on the present Chester line called Queens Park Halt. To further clarify the situation an entry on the 18th December, 1886, in the Minute Book of the board of directors of the LNWR, refers to the area being given for a public park." ^ Discovering Wartime Cheshire 1939-1945. Cheshire County Council Countryside and Recreation. 1985. pp. 47–48. ISBN 0-906759-20-X. ^  Archived 8 February 2018 at the Wayback Machine CWGC civilian casualty record, Crewe Municipal Borough. ^ Discovering Wartime Cheshire 1939-1945. p. 49. ^ Mark Gillies (10 May 2010). "Going Back in Time at the Bentley Factory". Car and Driver blog. Archived from the original on 9 August 2011. Retrieved 25 June 2010. ^ Fisher, Martyn (6 April 2018). "Bestway buys Bargain Booze". Better Wholesaling. Archived from the original on 6 April 2018. Retrieved 6 April 2018. ^ "The Sentinel". Archived from the original on 21 June 2010. Retrieved 13 October 2010. ^ "Cheshire East Council Crewe Vision documents". Archived from the original on 13 September 2010. Retrieved 12 October 2010. ^ "HS2 Birmingham to Crewe link planned to open six years early". BBC News. 30 November 2015. Archived from the original on 21 January 2016. Retrieved 16 January 2016. ^ "HQ Theatres". lyceumtheatre.net. Archived from the original on 5 September 2010. Retrieved 13 October 2010. ^ "Crewe Places of Worship, for Places of Worship in Crewe, Cheshire, UK". city-visitor.com. Archived from the original on 22 July 2011. Retrieved 8 March 2010. ^ "Page not found". cheshireeast.gov.uk. Archived from the original on 8 February 2011. Retrieved 13 October 2010. ^ "MMU Cheshire". Study in Cheshire. Archived from the original on 3 April 2014. Retrieved 25 September 2018. ^ "2012 Pre-Games Training Camp". mmu.ac.uk. Archived from the original on 13 July 2014. Retrieved 24 July 2014. ^ "Crewe Lifestyle Centre - Everybody Sport & Recreation". Archived from the original on 25 June 2016. Retrieved 15 June 2016. ^ Crewe Lifestyle Centre officially opens Archived 31 May 2016 at the Wayback Machine Cheshire East Council. May 27, 2016. Wikimedia Commons has media related to Crewe. Wikivoyage has a travel guide for Crewe. "Crewe" . Encyclopædia Britannica. 7 (11th ed.). 1911.